The Acting President, Yemi Osinbajo, on Friday, said the present administration since its inception on May 29, 2015, has proved to Nigerians that it can solve the nation’s problems, irrespective of their nature. Osinbajo said this in an interview with journalists in Kigali, the Rwandan capital, after attending the inauguration of President Paul Kagame. He cited efforts by the present administration to liberate the North East from the clutches of insurgents as an example of how the government had proved to Nigerians that it can solve their problems. He said the government had also been tackling the humanitarian crisis caused by the activities of the Boko Haram sect in the affected parts of the country. He urged African leaders to start looking inward and be directly involved in the destiny and future of their countries. 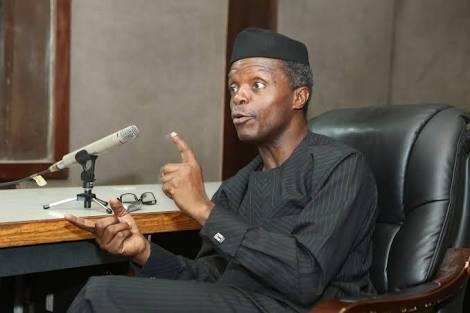 Osinbajo said, “That is a theme that has gone through the African Union and it is very resonant that we must solve our own problems; that African can solve its own problems and I think African nations have begun to demonstrate that. “We have shown in Nigeria that whatever problems we have, we can resolve them. We are doing so in the North-East, we are doing so with the humanitarian condition and all of that. “We are saying that we can take leadership in various respects; leadership in our economy. “We can handle the commanding heights of our economy and be directly involved in the destiny and future of our countries. The Acting President commended Kagame who has shown excellent leadership, particularly in the East African region, noting that his work was largely responsible for his re-election.